5am came a little too early Sunday morning. After a restless night of not enough sleep, it was time to wake up, fuel up (coffee and oatmeal) and get out to Hopkinton. I was shooting to get there by 6:45 for the 8am start. It was a beautiful morning. No rain, thankfully. A bit chilly at 57 or so degrees, though. I knew it would be little warmer by the start, but I wasn’t taking any chances. I was so cold waiting around for the start of the Sharon tri that I wanted to be prepared this time. I put on fleece sweatpants, a longsleeve t-shirt and a fleece sweatshirt. Oh, and my winter hat! Ready to go. What a well-organized event. Volunteers everywhere! And familiar ones at that. TE members Kelly, Jenn, Kristi, Becky, Rachel, and various parents and significant others were body marking, directing athletes, and getting ready to staff water stations. Team EnVision was well represented. Wow! – made it seem like a party. Well, almost like a party. Amy, Ruth and I still had some work to do. The water was a refreshing 72 degrees. Yikes! Definitely wetsuit worthy. The start was an in-water, TREADING-water start. No push off whatsoever. I positioned myself at the front and waited for the horn. Luckily we didn’t have to bob around kicking each other for too long before they sent us off. Straight shot 1/4 mile parallel to the beach, left at the last buoy and out. Quick and easy. On to the 3.1 mile run. The run started out the same as the bike: up a gradual (but very noticeable) incline and then down a hill to finally flatten out. Briefly. Back up a hill to a nice stretch along a levee kind of thing and across the beach to the finish arch where the crowd was going wild! People were cheering up a storm. For everyone. I love that about these races. And then there was food! What better way to end a race than with a potluck BBQ? Whether its swimming, biking, running or great food, TE knows how to BRING IT!! It was a beautiful day, full of sunshine and excitement alongside memorials and remembrances of those whose lives were changed forever ten years ago. I was so grateful to be there as a member of this amazing group of athletes. It was an opportunity to share in the joy and the excitement of this event but to also pay tribute and mourn the tremendous loss we all suffered as a result of the 9/11 attacks. This is my third Tri (no more Newbie waves for meJ ) and I was especially grateful for the TE woman who showed up in the pre-dawn darkness to cheer us on. Big thanks to Kristi, Becky, Rachel, Jen & Kelly for volunteering and cheerleading! It was really dark when I arrived and I whizzed by the entrance a few times, missed the turnoff for parking but got it together and schlepped all my gear to transition. Note: if you ever carpool with me be prepared to get up super early ‘cause I need a big margin for error! Downed an enormous cup of coffee (vitamin C) and got a great spot by the port-o-san and the Run Out (OK, TMI but hey, it’s a report) It was cold – so I put on the wetsuit and went for a 15 minute warmup swim. It was amazing –steam rose off the calm and fairly warm water which was around 71 degrees. 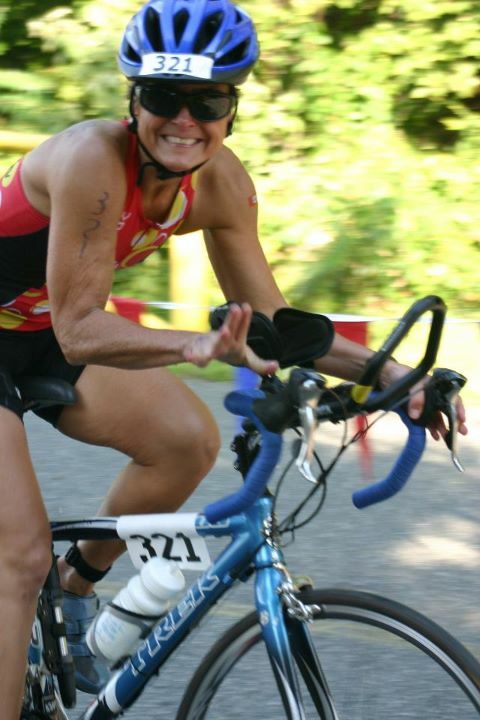 I felt pretty loose and psyched about the swim but worried about the hills on the bike route. The first hill was the hardest, not terribly steep but long. It was fine after that – I really focused on maintaining a steady cadence and blew down the hills, how much fun is that! Not much traffic and road conditions were just fine. Had a bit of a scare when coming down a hill at around mile 3 – a woman in front of me swerved and lost her water bottle which I missed by inches. Adrenalin is amazing stuff – felt like I was shot out of a cannon. Finished strong on the bike and then ran the first half mile with lead legs. It seems that if you are not somewhat self preserving in the bike that you pay for this in the run. I also did not take any nutrition in T2 so energy was lowish. Ya know, people tell you this stuff and it just doesn’t compute until you are out there feeing the pain. I got smoother and just when I was really flagging, I passed Kristy and Becky at the water station and it was amazing! They worked their cheering magic and I just lengthened my stride and got my second wind! I saw the familiar red and yellow TE jersey up ahead and caught up with Amy at mile 2.5. Love those tri tops – you can spot them for miles! Crossed the finish line with a stitch in my side and a smile on my face (made a conscious effort not to shoot anyone the death glare during run) I didn’t place in my age group(was 5th) but I had a blast! 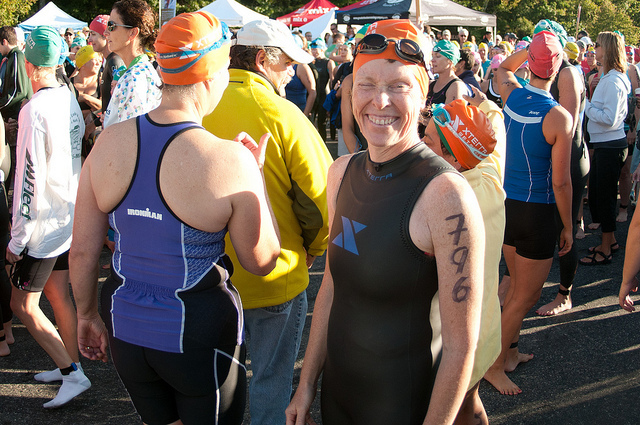 Congrats to Laurie Ellis who rocked her race and was the top swim split with a time of 7:50! She really is part fish! The best part – the post-race BBQ and berry cobbler! Amazing food and friends made this the best race of the season and I look forward to training with team TE this fall and winter!